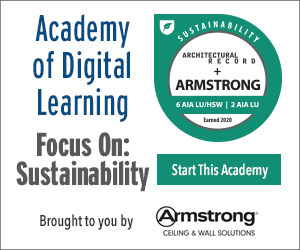 Explain the natural movement of air, heat, and vapor into and out of a building and how that relates to energy savings, occupant health, and durability. Discuss the history of building paper and weather-resistive barriers (WRBs). Identify the performance and testing characteristics of breathable, self-adhering WRBs and air barriers that contribute to a durable and energy-saving building. Describe the different types of air-barrier technology for a durable building envelope. 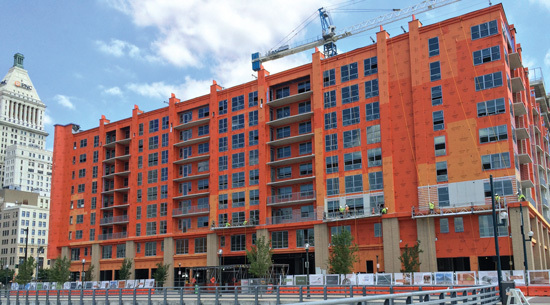 Examine several case studies where an innovative vapor-barrier system sped up construction, lowered costs, increased building envelope quality, and/or contributed to green building certification. In the beginning, humans were hot or cold, wet or dry, comfortable or miserable, all depending on the weather. As we evolved, comfort became a priority, and then energy savings, and eventually health and durability, and sustainability rose up in our collective concerns. Building paper and weather-resistive barriers (WRBs) have emerged and then evolved to meet our new needs and expectations. 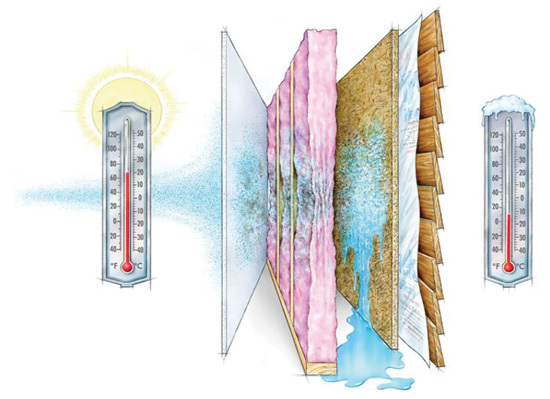 Today, the architect or specifier can choose from an astonishing array of weather-resistive/air barriers with various capacities and installation strategies, from those that are tacked, fastened on, glued on, sprayed on, and, ultimately, those membranes that self-adhere. To clarify the difference between weather-resistive/air-barrier choices, this article is about self-adhered, vapor-permeable WRBs/air barriers, and the role they can play in design and construction of superior buildings that satisfy owners, serve the needs of occupants, and help shield the architect/owners and general contractors from risk. We start with the basics of heat and energy flow, then review the history of air barriers, discuss the basics of self-adhered products and their installation benefits, and finally look at some case studies where a self-adhered WRB/air barrier was used to further the goals of designing and creating a superior building. Let’s begin with a review of basic building science. As buildings and what we demand of them have evolved, so has the technology for providing air, vapor, and water controls for the building envelope. The most sophisticated system using a self-adhered membrane is not only highly effective, but also simple to apply with a minimum of surface preparation, and can be applied during cold or rainy conditions. Such systems are a win for the designer, builder, and owner. In the design and construction of buildings, it’s important to understand how air, heat, and vapor move into and out of tight structures. The way air, heat, vapor, and liquid water move in and out of a building is best defined by the second law of thermodynamics. This is the study of heat and energy and how they “move” or transfer. When the designer and contractor understand how air, heat, and vapor move into and out of buildings, there is a better chance that the structure will be durable, healthy, and energy efficient. Air, heat, vapor, and liquid water—driven by the immutable laws of nature—move from more to less when given a chance. That means that higher concentrations move to lower concentrations. Hot moves to cold. Wet moves to dry. Higher pressure moves to lower pressure. This is easily understood during a northern winter. The cold air outside seems to “want” to come inside, but it’s really the warmth that wants to leave the house. Left uncontrolled, this will occur until the temperature is the same inside and outside. Insulation and air barriers keep the warm air from escaping in heating climates, predominantly northern states, and keeps the hot air outside in cooling climates, mostly in southern states. For insulation to be effective, we need an air barrier to control convective heat transfer. An air barrier is required whether the insulation performs that function or not. This will ensure that connections between the insulation materials as well as penetrations (windows, doors) and transitions from wall-to-wall, wall-to-roof, and wall-to-foundation are properly sealed. This calls for an air barrier to be installed in the building envelope. When the air pressure is not equal inside and outside (stack effect, wind, or mechanically induced pressure difference), and there is no identified air barrier, the air will move from high to low. This brings us to the issue of vapor, or water in a gas form. We feel most comfortable when the interior relative humidity ranges from 40 percent to 60 percent. In a hot and humid climate, it needs to be below 50 percent to manage some indoor air-quality issues. However, in the summer in the South, the outside relative humidity is often more than 90 percent. We use the air-conditioning to lower the temperature and the relative amount of moisture in the air in the form of vapor. The vapor movement from higher to lower concentrations through building materials is typically minor, as well as slow to necessitate additional vapor control over the natural vapor control of the materials used in wall construction.